Southampton artist Sarah Misselbrook uses her own body to create dramatic sculptures in materials as varied as household soap and white chocolate. She talks to KATE THOMPSON about her work, her motivation – and what she personally goes through to create some of her most adventurous pieces. 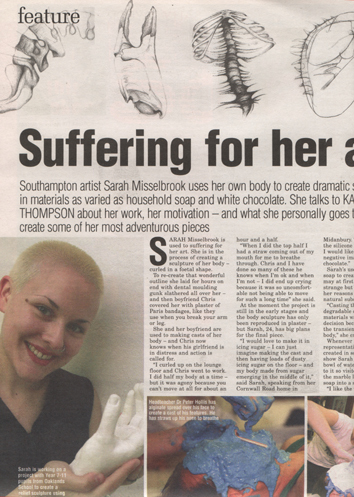 Sarah Misselbrook is used to suffering for her art. She is in the process of creating a sculpture of her body – curled in a foetal shape. To re-create that wonderful outline she laid for hours on end with dental moulding gunk slathered all over her – and then boyfriend Chris covered her with plaster of Paris bandages, like they use when you break your arm or leg. She and her boyfriend are used to making casts of her body – and Chris now knows when his girlfriend is in distress and action is called for. “I curled up on the lounge floor and Chris went to work. I did half my body at a time – but it was agony because you can’t move at all for about an hour and a half. “When I did the top half I had a straw coming out of my mouth for me to breathe through. Chris and I have done so many of these he knows when I’m ok and when I’m not – I did end up crying because it was so uncomfortable not being able to move for such a long time” she said. At the moment the project is still in the early stages and the body sculpture has only been reproduced in plaster – but Sarah, 24, has big plans for the final piece. Sarah’s use of chocolate and soap to create her body art may at first glance seem strange but the city artist has her reasons for using the natural substances. “Casting these pieces out of degradable or edible materials was a conscious decision because they echo the transient nature of the body,” she explained. Whenever Pure – the representation of her torso created in soap – goes on show Sarah makes sure a bowl of water is placed next to it so visitors can transform the marble like texture of the soap into a sea of suds. “I like the way it can be transformed. The surface of it is covered in tiny cracks now and it is physically shrinking so it does mirror what happens to our own bodies. “As for the white chocolate, I like the idea that it is not normally used in sculpture – and as it ages the surface becomes a bit powdery. “Mind you I have to be careful how they are stored – the soap sculptures need to be kept in a warm atmosphere but obviously that’s no good for the chocolate works so I keep those in my studio where it’s nice and cool,” she explained. Sarah has taken casts of most parts of her body – her hands and feet and even her nose. “This is my body of work – quite literally. When it goes on show I love the reaction that my work gets from the public. They can’t help touching the pieces and that’s exactly what I want them to do,” she said. She and Chris have recently converted their garage into a studio where Sarah can really let her imagination run wild. “At last I’ve got the space to really spread out – it means we won’t have to put down sheets and things in our lounge the next time I want to take a cast of my body,” said Sarah. Chris is a graphic designer working for a city firm and he has helped Sarah produce publicity material for her exhibitions. “He is incredibly supportive and we work well together. He makes up all my publicity material – and his father Roger has photographed all my work,” she said. Her work has been exhibited locally – and like many a struggling artist before her Sarah is eager for her sculptures to receive the acclaim they deserve. “I would love to have more regular exhibitions. I don’t think London is the be all and end all for art – but it would be fantastic to walk into a big gallery and see my work on show,” she said. For the future, Sarah has a few more ideas up her sleeve – but once again her body will remain the focus for her work. “Just being a woman makes you more aware of the body processes and functions that’s why I like to use my body in my work. “Eventually I would love to do some performance work still using my body and maybe make it video based – it’s got to be worth a try,” she said.